Southall was first mentioned in 1198 and the early hamlet seems to have grown up around Southall Green. This remained a rural part of the manor of Norwood even after the cutting in 1796 of the Grand Junction (now Grand Union) Canal and the opening of Southall station in 1839. In the second half of the 19th century the main change to the landscape was the appearance of brick­fields, with cottages for their labourers. Widespread devel­opment did not begin until the 1890s, with factories flanking the railway line. As in other parts of the borough, it was the arrival of affordable and convenient electric trams in the early years of the 20th century that brought a surge in suburban house­building. By 1944 overcrowding was said to have reached ‘acute’ propor­tions but recom­mend­a­tions that indus­trial devel­opment should cease were not followed. From the late 1950s onwards, Asian immig­rants began to settle in Southall. Its proximity to Heathrow and the avail­ab­ility of work in local factories were both influ­ential factors, but the subsequent escal­ation has been a snowball phenomenon that could have happened almost anywhere. Punjabis are the main ethnic sub-group and the principal religion is Sikhism, but there are also many Hindus and Muslims, most from India, some from Pakistan, and and a few from Bangladesh and east Africa. Around the vibrant central shopping areas of the Broadway and South Road over three-quarters of the residents are now of Asian origin. The Southall Sikh Cultural Society was founded in 1960. The Jamia Masjid Islamic Centre, shown in the photo­graph at the top,* was estab­lished in 1965. Southall gained a reputation as the Asian community’s equivalent of Brixton with the racist murder of Gurdip Singh Chaggar in 1976, the death of the protester Blair Peach following a National Front meeting in 1979 and the Southall riots of 1981. Comparative calm subsequently descended, although there has been internecine political violence, including the murder of a Sikh newspaper editor in 1994. As wealthy Indians move out to leafier suburbs, new ethnic groups are taking their place, including Somalis and, more recently, Afghan Sikhs. 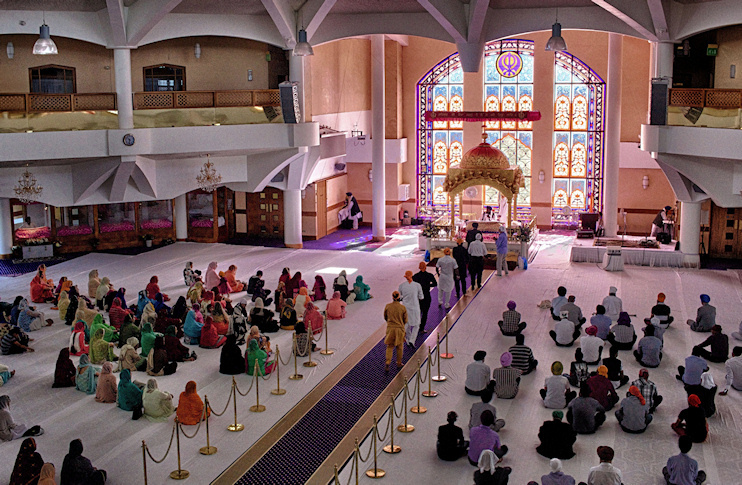 Opened on Havelock Road in 2003 and shown in the photo below, the Gurdwara Sri Guru Singh Sabha is one of the largest Sikh temples outside India. Havelock Road is named after Sir Henry Havelock – a British general who distin­guished himself in the Afghan and Sikh Wars in the 1830s and 1840s and played a leading role in suppressing the Indian Uprising in 1857–8 – and some campaigners have suggested that the road should be renamed. The Southall Big Plan was a five-year programme of improve­ments completed in 2018. The programme encom­passed a wide range of projects, ranging from upgraded community facil­ities to the encor­agement of better social behaviour but partic­u­larly focussing on improve­ments to Southall’s streets, including the trans­form­ation of Southall Broadway in a £6m-project completed in June 2015. 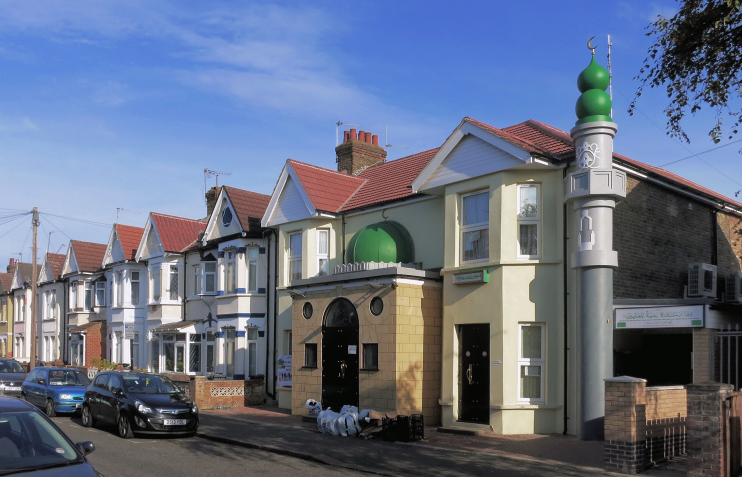 * The picture of the Jamia Masjid Islamic Centre at the top of this page is adapted from an original photograph, copyright Des Blenkinsopp, at Geograph Britain and Ireland, and the interior view of the Gurdwara Sri Guru Singh Sabha is cropped and slightly modified from an original photograph, copyright cchana, at Flickr. Both images are made available under the Attribution-ShareAlike 2.0 Generic Licence. Any subsequent reuse is freely permitted under the terms of that licence.